Category: Books. Tags: Artist Books, Dorothy Circus Gallery, popsurrealism, Walk on the Wild Side. 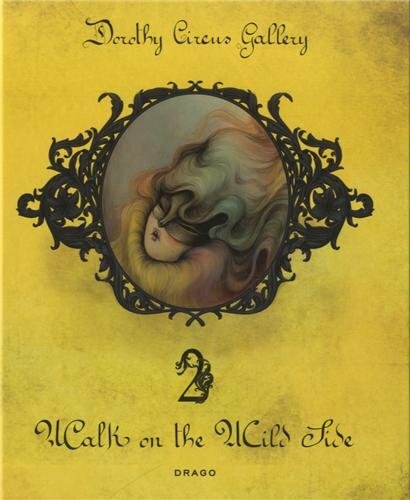 Walk on the Wild Side is the second volume of the trilogy telling the story of Dorothy Circus, the most famous Pop Surrealism gallery based in Rome. Alexandra Mazzanti, owner and curator, stood out immediately for her artistic foresight and her unconditional love for the Low Brow & Pop surrealism movements. She deeply believes in her project and its potential, so much so that she has made of Dorothy Circus a landmark of its genre – in particular especially in the European market, where the gallery has become the first reference point for Pop Surrealism in Europe. Walk On the Wild Side is a yearbook of the gallery, where you can find all the events and artists who populated the area in 2012, with critical essays, biographies and lot of pictures. The volume includes exhibitions such as Secrets from the Hourglass by Leila Ataya, Cinephonica by Aaron Jasinski Last Drop of Innocence by Valentina Brostean, Fame: I’m going to Live Forever by Scott Musgrove and Wild at Heart by Miss Van. As well as many group shows like Stay Foolish! with Esao Andrews, Ray Caesar, Ron English, Tara Mcpherson, Jeff Soto, Marion Peck and Mark Ryden, Inside Her Eyes featuring Leila Ataya, Afarin Sajedi, Natalie Shau, Kwon Kyungyup and Green Blood with Tara McPherson, Jeff Soto, Martin Wittfooth, Travis Louie, Lola, Brandi Milne, Leila Ataya, Nicoletta Ceccoli, Roland Tamayo, Ana Bagayan, Scott Musgrove and many more. About Green Blood Hi Fructose wrote: “The opening night attracted the who’s who in Rome, which is always a good thing when the proceeds go to the charities Greenpeace and Oceania”. So, if contemporary art is the Oyster, Pop Surrealism is the Pearl. Dorothy Circus Gallery is a space dedicated to Pop Surrealism and new tendencies of figurative arts. Opened in Rome in 2007, the gallery was born on the boundaries between New York and Wonderland, and has the merit of having brought for the first time on scenes of Italian contemporary art artists such as Jonathan Viener, Ron English, Sas and Colin Christian, Camille Rose Garcia, Alex Gross, Joe Sorren, Tara Mc Pherson, James Jean, Travis Louie and many others.